The Roswell incident is UFOlogy’s Holy Grail and the industry that has grown up around it never sleeps. On Tuesday, 5 May the world may, or may not, be rocked to its foundations when the showmen behind the latest chapter in the Roswell saga unveil two colour slides that supposedly show “an unusual body in a glass case”. The creature has a small thin body with a large head so, hey presto, it must be an extraterrestrial. And as experts have concluded the Kodachrome film was definitely exposed in 1947 it may – or may not – show one of the aliens whose flying saucer crashed in New Mexico and was recovered by the US government. Up to present only tantalising glimpses of the images have been released, via a YouTube ‘teaser’, to fuel the bandwagon as it rolls towards Mexico City, where the images will be revealed in the presence of UFO pundit Jaime Maussan. Internet flame wars are raging between those promoting the images as the fabled ‘smoking gun’ and skeptics who have annoyingly poked wide gaping holes in the story. In his teaser sports writer Adam Dew, who appears to be the custodian of these images, says they were found inside a box containing 400 old slides that turned up in Sedona, Arizona during 1998. The box may (or may not) have belonged to geologist Bernard Ray and his wife Hilda Blair Ray, who was an attorney and amateur pilot. The couple travelled widely and their photographs include images of celebrities such as Bing Crosby, Clark Gable and General Eisenhower at public events in the late 1940s. But even if this is true there is absolutely no evidence that the Rays had any political or intelligence connections that would have allowed them access to Top Secret material. The one flimsy connection with Roswell is that Bernard was a president of the West Texas Archaeological Society and may have visited New Mexico in 1947-8. Dew says that he is ‘not making any claims’ but then goes on to state the creature appears to be between 36-40 inches in length, its head is larger than its torso and it has ‘some unusual features’. Sceptics have pointed out these features do not prove the creature is an extraterrestrial. It could equally show the body of a child with hydrocephalus or indeed the remains of an ancient mummy of the type stored in assorted museums across North America and Europe. 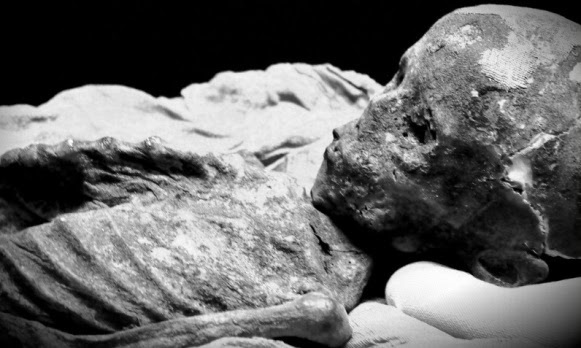 Jose Antonio Caravaca, for example, says the ‘alien corpse’ has remarkable similarities to a child’s mummy discovered in Egypt in 1856 that is now at the Smithsonian in Washington. But why let such awkward problems stand in the way of such a good story? Dew says that logic tells him ‘…it’s probably nothing but I just can’t shake the thought that maybe…just maybe…it’s something’. Even so, some of the UFO industry’s biggest proponents have dismissed the slides as having nothing to do with Roswell. Stanton Friedman has said he’s going to observe the dog and pony show from a safe distance because he doesn’t “want to appear to add legitimacy by my presence in Mexico City”. Robert Hastings has gone further, saying the slides are ‘….likely to become one of the most embarrassing missteps in a seven-decade-long effort by ufologists to gather and publicize data pointing to the reality of the UFO phenomenon and its probable extraterrestrial nature’. 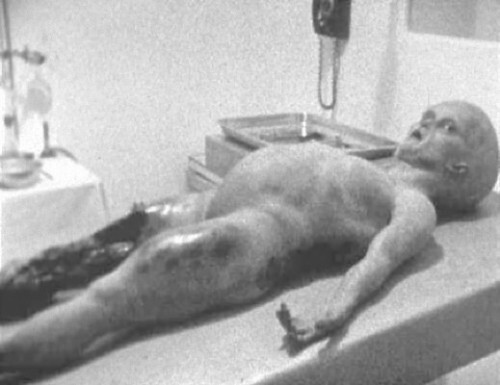 5 May 2015, the day that some claim will change the world forever, is exactly 20 years since the hoaxed footage of the ‘Alien Autopsy’ was first shown to a hushed gathering of UFOlogists, journalists and others at the Museum of London. This entry was posted in Uncategorized and tagged Adam Dew, alien autopsy, Bernard Ray, Bing Crosby, Clark Gable, General Eisenhower, Hilda Blair Ray, Jaime Maussan, Mexico City, New Mexico, Ray Santili, Robert Hastings, Roswell, Roswell incident, Roswell slides, Stanton Friedman, Top secret. Bookmark the permalink.